STAY IN TOUCH AROUND THE OFFICE. One Headset for your Desk and Softphone. 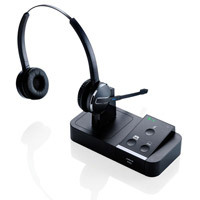 The Jabra PRO 9450 dual connectivity wireless headset is a user-friendly device providing office staff with a plug-and-play compatible interface to handle calls from both desk phones and UC softphones. It is therefore ideal for companies in transition to UC, or any organization using a combination of these two types of phones. With the Jabra PRO 9450, everyone has an opportunity to benefit from true wireless hands-free communications for enhanced productivity! Handling UC calls has never been easier. 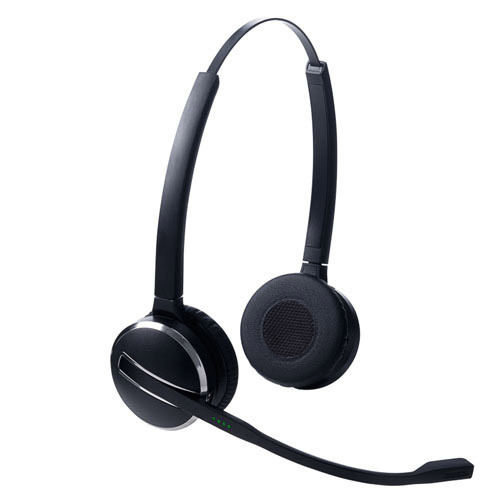 Part of the award winning Jabra PRO9400 Series, the Jabra PRO 9450 has intuitive touch pad controls for easy call handling it"?s suitable for everyone, even first time headset users! They can answer calls in four different ways: when away from their desks, using the headset; at their desks by pressing the button on the headset base touch pad, or using Jabra Call Manager software or computer keyboard shortcuts. Thanks to state-of-the-art audio technologies, Jabra PRO 9450 delivers exceptional audio performance. A noise canceling microphone ensures that the user"?s voice is heard clearly; wideband quality makes the incoming sound crystal clear. Jabra PRO 9450 also has a unique feature designed for silent offices" a built-in ringer which makes it possible to hear softphone calls, even when not wearing the headset. Jabra PRO 9450 is 100% software based providing investment protection by lowering your total cost of ownership. The system comes with free mass deployment software via Jabra PC Suite to facilitate installations that can be updated easily with drivers for new phones and new features as technology evolves. Being compatible with all leading brands of desk phones and Unified Communications applications, Jabra PRO 9450 supports easy integration with your chosen UC platform. The intuitive user friendly touch pad makes Jabra PRO 9450 DUO suitable for everyone, even inexperienced headset users!